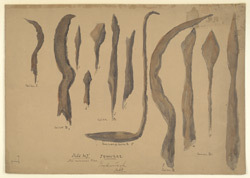 Watercolour by Philip Meadows Taylor (1808-1876) of iron objects, including two sickles and an iron lamp with a hook, from cairn circle graves, at Jivarji in the Gulbarga district of Karnataka, dated 1851. The image is inscribed on the front in ink: 'Jewurgi. Meadows Taylor Delt. All natural size, Sketch No. 7'; also with notes. Portions of this image were reproduced in Taylor's 'Descriptions of Cairns, Cromlechs, Kistvaens and other Celtic, Druidical or Scythian monuments in the Dekhan' (Dublin, 1865). Objects No.2 and No.9, a billhook and a sickle, were both found during the excavation of cairn B and are reproduced together on a page at quarter of their original size. Object No.8, a lamp, "...was found hooked into the shale at the head or north end of the grave." of cairn E and is reproduced at half its original size.